DHA is vital for normal brain development of the fetus and infant, and for the maintenance of normal brain function throughout life. Omega-3 Oils, including DHA, have been found to also help cardiovascular health. 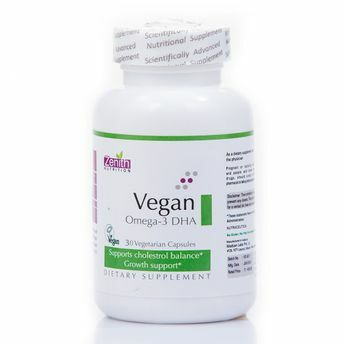 Many vegetarians, vegans and raw food dieters are at risk of having insufficiencies of DHA unless they take supplement. The DHA used in Zenith Nutrition Vegan Omega-3 DHA is derived from algae and manufactured under sanitary conditions. It is clean, safe and free of contaminants. Explore the entire range of Omega Fatty Acids available on Nykaa. Shop more Zenith Nutrition products here.You can browse through the complete world of Zenith Nutrition Omega Fatty Acids .Alternatively, you can also find many more products from the Zenith Nutrition Vegan Omega-3 DHA Capsules range.